The Salt Rock Adopt-a-Road project is nearing completion, as the alien invasive weeds which were the primary reason for starting the project have now been almost eradicated. Only spot-work is necessary from time to time. The road on the entrance to Salt Rock is being cleared of alien invaders, by the Green Team and is already showing a huge improvement. We also began an alien weed eradication project in Zen Park. Although this park is supposed to be cleared by the Dept. of Public Works on an annual basis, this is rarely done. So we decided to seek permission to have the weeds cleared by our Contractor, AgriSpray, and we are pleased to say the indigenous trees have been coming back beautifully. The conservancy to plant trees along the new Simbithi Drive. This project was sponsored by Wayne Cody and Chris Oosthuizen of Dolphin Coast Waste Management. They also sponsor the on-going maintenance of the trees that were planted. 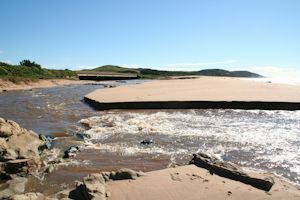 This is being done on the Ballito Promenade and other coastal areas. A Drop-Off recycling centre wasestablished at the Ballito Bay Mall lower parking area at the end of last year. Clear plastic, cardboard, paper, glass and tins being collected for recycling. The site is manned by a Conservancy employee six days per week, from 8am to 4pm. The Dolphin Coast Conservancy Green Team are very busy all year round, even during holidays, working hard to make the Dolphin Coast a good looking place to live in and visit. Here the team are removing alien weeds, which are taller than they are, from the beach parking, opposite Santorini. 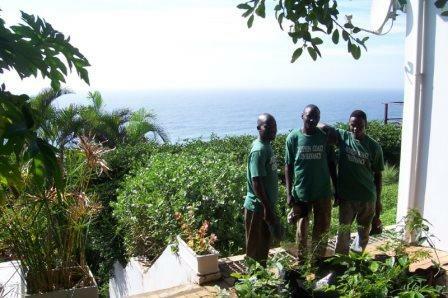 Green Team workers prepare trees which have been nurtured by conservancy members, to be planted out in Ocean Drive. 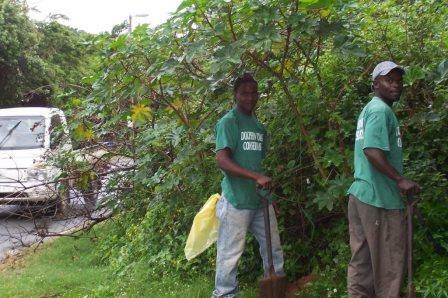 They also recently tidied up the Ballito and Umhlali Library gardens.